Now when Jesus entered Jerusalem riding on the young colt, the whole city was stirred up, saying, "Who is this?" And the crowds declared, "This is the prophet Jesus, from Nazareth of Galilee." 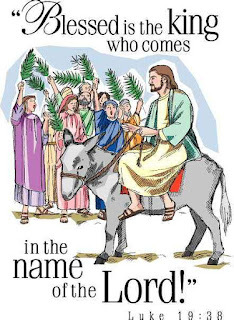 But when the chief priests and the scribes saw the wonderful things that he did, and the children crying out in the temple, "Hosanna to the Son of David!" they were indignant, and they said to Jesus, "Do you hear what these children are saying?" And Jesus replied, "Yes; have you never read, "'Out of the mouth of infants and nursing babies you have prepared praise'?" Soon afterwards, Jesus and his disciples left the temple, going to the city of Bethany to spend the night there. Early the next morning, as Jesus was returning to Jerusalem, he was hungry. And seeing a fig tree by the wayside, he went to it and found on it nothing but leaves. And he said to the tree, "May no fruit ever come from you again!" And the fig tree immediately began to wither. When the disciples saw it, they marveled, saying, "How did the fig tree shrivel so quickly?" And Jesus answered them, "Of a truth, I say to you, if you have faith and do not doubt, you will not only be able to do what has been done to the fig tree, but even if you say to this mountain, 'Be taken up and thrown into the sea,' it will happen. And whatever you ask in prayer, you will receive, if you have faith." And when Jesus arrived at the temple, the chief priests and the elders of the people came up to him as he was teaching, and chided him saying, "By what authority are you doing these things, and who gave you this authority?" Jesus answered them, "I also will ask you one question, and if you tell me the answer, then I also will tell you by what authority I do these things. The baptism of John, from where did it come? Was it from heaven or from man?" And they discussed it among themselves, saying, "If we say, 'From heaven,' he will say to us, 'Why then did you not believe him?' But if we say, 'From man,' we are afraid of the crowd, for they all consider that John was a prophet." So they answered Jesus, "We do not know." And he said to them, "Neither will I tell you by what authority I do these things. Then Jesus began to tell a story: "What do you think? A man had two sons. And he went to the first and said, 'Son, Please go and work in the vineyard today.' Being very busy with other things, the son answered, 'I can't today,' but afterward he changed his mind and went. So the man went to the other son and asked him to go work in the vineyard. And this son answered, 'Absolutely, I will go,' But he did not go. Which of the two son's did the will of his father?" The Priests and the elders said, "It was the first son who changed his mind and went." Jesus said to them, "Truly, I say to you, the tax collectors and the prostitutes go into the kingdom of God before you. For John came to you in the way of righteousness, and you did not believe him, but the tax collectors and the prostitutes believed him. And even when you saw it, you did not afterward change your minds and believe him. Today we all have our opinions, and many of us have some sort of religious training, but consider to re-think your options, and realize that Jesus is the Son of God, the Only way to heaven. It is time to put aside all traditions and understand the religion is a form, but serving Jesus is a Reality. Jesus desires to have a personal relationship with you that will continue through out eternity. 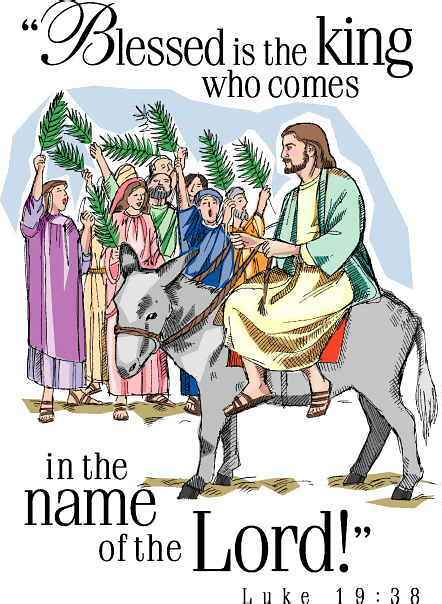 Today's happening of the Triumphal Entry is shared in all four of the Gospels. Jesus was on a mission to arrive in Jerusalem, but as he was passing through the city of Jericho there was a small man named Zacchaeus, a chief tax collector, and he was very rich. The man was trying to see Jesus, but on account of the crowd and him being so short, he could not see Jesus. So he ran on ahead and climbed up into a sycamore tree in order to see him, because Jesus was about to pass that way. And when Jesus came to the place, he stopped and looked up in the tree and called his name; “Zacchaeus, hurry and come down, for I must stay at your house today.” So he hurried and came down and received him joyfully. Each of us must understand that Jesus knows OUR name and regardless of our past, he is calling you to open the door of your heart so he and you may enjoy fellowship. So they went and found it just as Jesus had told them. And as they were untying the colt, its owners said to them, “Why are you untying the colt?” And they said, “The Lord has need of it.” And they brought it to Jesus, and throwing their cloaks on the colt, they set Jesus on it. And as he rode along, they spread their cloaks on the road and some threw down palm branches with children dancing and rejoicing. This same crowd who that day shouted Blessed is the King, would in a few days change their words to be "We have no king but Caesar - - so crucify this man Jesus." Today is a good day to make your declaration. Jesus is MY King and I will praise Him and will serve Him all the days of my life. Know that Jesus is calling your name and He desires to be your King. Early in the ministry of Jesus, certain Greeks desired Philip to bring them to see Jesus. Before them all Jesus began to pray: My soul is troubled; Father, save me from this hour: but for this reason I came and am facing this hour. Father, glorify thy name. Then there came a voice from heaven, saying, I have both glorified it, and will glorify it again. The people that stood by heard the voice but said it must be thunder. Jesus answered and said, This voice came not because of me, but for your sake. And I, if I be lifted up from the earth, will draw all men unto me. This he said, signifying what death he should die. Jesus tried to prepare his disciples about his death; that He must suffer many things, and be rejected of the elders, and of the chief priests, and scribes, and be killed, and after three days rise again. But the disciples refused to listen because they did not like this kind of message. Peter openly rebuked Jesus saying "Not so Lord, please do not talk this way, because you are scaring us." Jesus told Peter that he was listening to the wrong voice and it was time for them all to begin to understand the Big picture of God's eternal plan of salvation. Jesus even mentioned the cross as he shared: from Marks's Gospel chapter 8; Whosoever will come after me, let him deny himself, and take up his cross, and follow me. For what shall it profit a man, if he shall gain the whole world, and lose his own soul? Or what shall a man give in exchange for his soul? A few days later as they passed through Galilee; Jesus the second time, again taught his disciples about his death, and said to them, The Son of man is soon to be delivered into the hands of men, and they shall kill him; and after that he is killed, he shall rise the third day. But they did not understand his saying, and were afraid to ask him. You would think the followers of Jesus might get a clue after being told twice that he was about to be betrayed, killed and rise again, but no they were dense and a third time Jesus attempted to help them to understand as they went up to Jerusalem. Matthew's gospel chapter 20 says it this way: And Jesus took the twelve disciples aside, and said unto them, Behold, we go up to Jerusalem; and the Son of man shall be betrayed unto the chief priests and unto the scribes, and they shall condemn him to death, And shall deliver him to the Gentiles to mock, and to scourge, and to crucify him: and the third day he shall rise again. Another time Jesus again tried to prepare his disciples that he was going to leave them. Johns Gospel chapter 14 Jesus shared: In my Father's house are many mansions: if it were not so, I would have told you. I go to prepare a place for you. And if I go and prepare a place for you, I will come again, and receive you unto myself; that where I am, there ye may be also. Again, they did not understand that Jesus was saying He was the way to heaven if they would believe in him. Jesus continued saying; These things have I spoken unto you, while I am still here with you. But I will not leaved you comfortless, For the Comforter, which is the Holy Ghost, whom the Father will send in my name, he shall teach you all things, and bring all things to your remembrance, what ever I have said unto you. It is good for us all to think on these things. It is good to rejoice that the story has a happy ending, but not a final conclusion. The message for today is from John's gospel chapter 11. But when Jesus heard it he said to his disciples, “This illness does not lead to death. It is for the glory of God, so that the Son of God may be glorified through it." Jesus said to them, “Our friend Lazarus has fallen asleep, but I must go to awaken him.” The disciples said to him, “Lord, if he has fallen asleep, perhaps we should let him rest.” Now Jesus had spoken of his death, but they thought that he meant taking rest in sleep. Then Jesus told them plainly, “Lazarus has died." 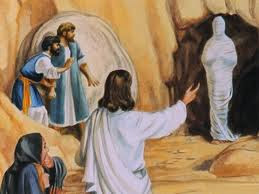 Now when Jesus arrived just outside the village of Bethany, he was told that Lazarus had already been in the tomb four days. Now many of the Jews had come from Jerusalem to comfort Martha and Mary concerning their brother's death. So when Martha heard that Jesus was coming, she went to meet him, but Mary stayed with the others. When she had said this, she hurried back to speak with her sister Mary, saying, “The Master is here and is calling for you.” And Mary immediately got up and went to him. When the Jews who were with her in the house, saw Mary get up so quickly, they followed her, supposing that she was going to the grave to weep. When Mary came to where Jesus was and saw him, she fell at his feet, saying, “Lord, if you had been here, my brother would not have died.” When Jesus saw her weeping, and the Jews who had come with her also weeping, he was deeply moved in his spirit and greatly troubled. Some have wondered why Jesus was weeping ? ? The crowd thought he was weeping because Lazarus was dead; but wait - - there was another reason Jesus was so moved. Both Martha and Mary had just blamed Jesus for their brother's death saying if you had come sooner when we first sent you the message, our brother would still be alive - so there. In their sorrow, these harsh words were like a slap in the face to Jesus. Tenderly Jesus told them he was going to rise Lazarus from the dead, but both women were so deeply involved in grief, and entrenched in Unbelief, they could not accept what Jesus was telling them about the present day. Instead they could only refer his words to an event in the far away future. Even the crowd was against him, saying all kinds of negative remarks about Jesus. He marveled at all their unbelief. But one of them, Caiaphas; who was high priest that year, said to them, “Don't you understand that it is better for you that one man should die for the people, not that the whole nation should perish.” Being high priest that year he prophesied that Jesus would die for the nation, and not for the nation only, but also to gather into one family the children of God who are scattered abroad. So from that day on the religious council made plans to put Jesus to death. I am reminded in Hebrews 13:8 that Jesus is the same yesterday, today and forever, yet we too are guilty at times of relegating our miracle to the future instead of realizing that God desires for us to enjoy health, provision, protection now, today. As Jesus told Mary and Martha, "I am the resurrection and the life, and those who believe in me shall never die." Wait a minute, don't we all expect to die someday? Yes, but what was Jesus really saying. Eternal Life is ours when we receive Jesus, so when a believer "dies" physically on this earth, their Spirit does not die, but is merely continuing on in a different form of life everlasting with Jesus in heaven. If you have not already do so - - Receive Jesus now - and receive His eternal Life in your spirit. 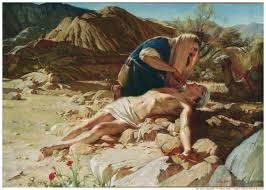 Who is Jesus chapter 34b Jesus spits - - this time on a Blind man. During the ministry of Jesus, he healed all kinds of diseases, including deafness and blindness. We remember the happening of the man born blind, who was healed on the Sabbath day. On that day, Jesus spit and made mud rubbing it on his eyes. I wonder if he was simply creating new eye balls and putting them into the man's eyes. Anyway, religious leaders after questioning the now healed man, cast him out of the synagogue for believing on Jesus. His parents were afraid they too might be cast out, but they did admit to the leaders that this was their son who was born blind and now he can see. Mark's gospel, chapter 8 tells the story of another blind man healed by Jesus. At Bethsaida some people brought to Jesus a blind man and begged him to touch him. For some reason, Jesus wanted privacy, so he took this blind man by the hand and led him out of the village away from the crowd. And so they called the blind man, saying to him, “This is your lucky day. Get up; because Jesus is calling you.” And throwing off his blanket, he jumped up and came to Jesus. The blind man said to him, “Rabbi, that I might recover my sight.” And Jesus said to him, “Go your way; your faith has made you well.” And immediately his sight returned to him and he followed Jesus. Today my friend, Jesus is calling you; Jesus is saying, "Come to me, what is it you want me to do for you?" Although I don't believe in lucky days, but I do believe in Blessed days, and today can be your day of blessing when you come to Jesus and lay out your life before Him. Just tell Him like it is. Often we are blinded to the truth and all it takes is for God's light to shine in our hearts and reveal to us the reality of Jesus being the one who can bring you into the family of God and cause you to become his child. By His Holy Spirit, he sets up His kingdom in the hearts of believers. Do you believe Jesus is the Messiah? You can ask him to open your eyes to see all that He desires you to be. It is as simple as saying; "Here I am Lord Jesus, I come to you now, open my eyes so that I may see all you have for me." Labels: Who is Jesus chapter 34b Jesus spits - - this time on a Blind man. The Jewish religious leaders were always disapproving of Jesus and condemning him, especially because Jesus healed people on the Sabbath day. Also from what he was teaching; Jesus was putting himself equal with His father God and they were furious. So one day they criticized the disciples eating bread without going through the traditional way to wash your hands. Jesus rebuked them by saying: "Isaiah did prophesy well about you hypocrites, as it is written; 'This people honors me with their lips, but their heart is far from me; in vain do they worship me, teaching as doctrines the commandments of men.' "You leave the commandment of God and hold to the tradition of men." Jesus said to them, "You have a fine way of rejecting the commandment of God in order to establish your tradition! God's word says to honor your father and your mother, but you use the money that should go for your parents support, for other things and say it is for God's work. Jesus went on to speak of defilement as to what is in your heart; "What comes out of a person's heart is what defiles him. For from within, out of the heart of man, come evil thoughts, sexual immorality, theft, murder, adultery, coveting, wickedness, deceit, sensuality, envy, slander, pride, foolishness. All these evil things come from within, and they defile a person." Jesus turned his back and moved on . . .
And from there he arose and went away to the region of Tyre and Sidon. And he entered a house and did not want anyone to know where he was, never the less, he could not be hidden as word spread. But immediately a woman whose little daughter had an unclean spirit heard of him and came and fell down at his feet. Now the woman was a Greek, a Syrophenician by her nation; And she begged Jesus to cast the demon out of her daughter. 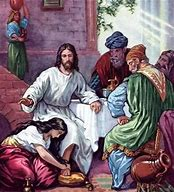 The disciples asked Jesus to send her away because she is bothering us and besides, she is a Gentile, she is not worthy of help. But Jesus answered and said to her, "I am sent to the lost sheep of the house of Israel." Then she came and worshiped him, saying, "Lord, help me." Jesus continued saying: "Let the children be fed first, for it is not right to take the children's bread and throw it to the dogs." But she answered him, "Yes, Lord; yet even the dogs under the table eat the children's crumbs." And he said to her, "For this wise statement you may go your way; the demon has left your daughter." And she went home and found her daughter calmly resting in bed and the demon was gone. Then he returned from the region of Tyre and went through Sidon to the Sea of Galilee, in the region of the Decapolis. And they brought to Jesus a man who was deaf and had a speech impediment, and his friends begged Jesus to lay his hands on him. And Jesus took the man aside away from the crowd privately, he put his fingers into his ears, and after spitting touched the man's tongue. And looking up to heaven, he sighed and said to him, "Ephphatha," that is, "Be opened." And his ears were opened, his tongue was released, and he spoke plainly. And Jesus charged them to tell no one. But the more he charged them, the more earnestly they proclaimed his fame. And the people were astonished beyond measure, saying, "Jesus has done all things well. He even makes the deaf to be able to hear and the mute to speak." Today we see that God desires our heart to be changed if we are harboring sin or ill will towards others. We also viewed that Jesus had mercy on a Gentile woman who was not a Jew and delivered her oppressed daughter. Amazing enough was the fact that blindness, deafness and not being able to speak was viewed as a curse and it was a custom for people to spit on them in disgust. Jesus used his spit to bless the man by touching his tongue and healing his speech and also cured his deafness. Wow; Jesus is the Awesome teacher, mighty deliverer, and healer of spirit, soul and body. Who is Jesus? Chapter 33 Who is my Neighbor? The happenings in today's message are taken from the Gospel of Luke chapter 10. Jesus replied with a story as he often did to explain; “A man was going down from Jerusalem to Jericho, and some robbers surrounded him, stripped off his clothes, beat him and left him half dead lying in the road. Now as it so happened a priest was going down that road, and when he saw the injured man he gingerly pulled up his robe so as to not soil it, and crossed to the other side of the road. Soon a Levite approached but when he saw the wounded man, he also passed by on the other side. So in today's broadcast we have considered that as believers we can go forward in Jesus name and especially rejoice that our names are written in heaven. We must also consider that our neighbor is the person who needs our help. And may we always be reminded that no matter how busy we are doing those things that seem important to us, we must also take time to sit at Jesus feet and learn more about Him and all He desires for us to do for Him. Labels: Who is Jesus? Chapter 33 Who is my Neighbor? Jesus had been traveling and teaching for many hours and the day was nearing evening. One of the Pharisees asked Jesus to come to his home and eat with him, and so he went into the Pharisee’s house and reclined at a table. And behold, a woman of the city, who was a sinner, when she learned that Jesus was having a meal in the Pharisee’s house, brought an alabaster flask of sweet smelling ointment, and standing behind him at his feet, weeping, she began to wet his feet with her tears and wiped them with the hair of her head and kissed his feet, anointing them with the ointment. The woman; a sinner had some to worship Jesus and show her love for him, and he repaid her by forgiving her sins, and telling her to go in peace. Jesus knew she was a sinner, because Jesus knows all about each and every one of us. He understands we are frail, but He wants to make us strong. He is ready to forgive the sins of the worse sinner and also the sins of those who think they are good enough already and don't need to be forgiven. The woman did not care what others thought about her, she came to Jesus and received forgiveness and she left a righteous person. Jesus is reaching out today to forgive your sins, large or small, regardless - - Jesus loves and cares for you and will always be with you no matter what. Kneel at his feet and he will accept you into His kingdom.